There are many illustrations in my Digital Myst Book project, and I've decided to provide at least the maps as a separate download, mostly because there aren't lots of good Myst maps out there. The map is in JPG format and is drawn by hand on a computer, using a Wacom Cintiq 21UX. The format is 726x1000 pixels and is meant for web use. If you want a bigger map (2179x3000) with transparencies and in layers for some print job, contact me and we'll see what we can do. Thanks for making your Myst map available. I am a primary school teacher in Australia and I am using it with my year 4/5 class. We have started a writing unit using the game 'Myst'. This is a great simple version of the map that the children will be able to follow and understand. We will be using the map in our classroom and will be posting to our class blog as we travel around the island and the different ages. I have only just found this web site. Your drawings are absolutely immaculate! I really hope that go more. 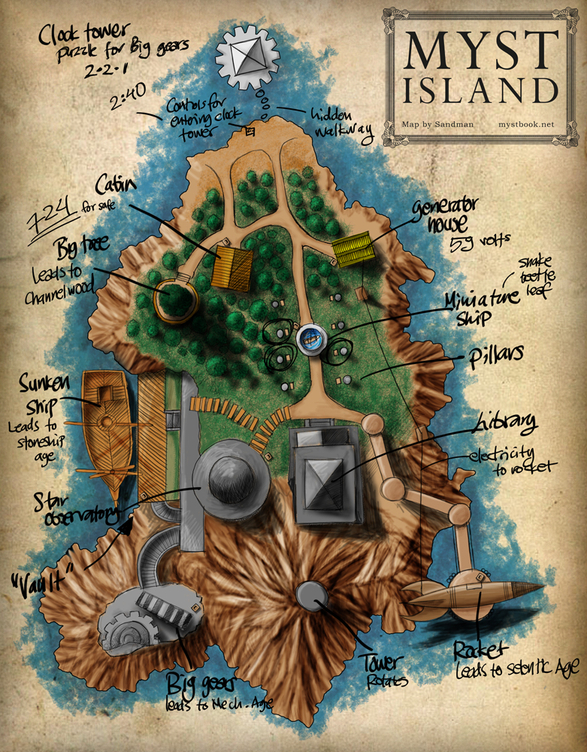 All the other games in the Myst series, as well as Riven, are crying out for your artistic skills. ...Er, minus the solutions, of course. I decided to start playing Myst after a 15 year break and these maps beat anything I could have done. Thanks for sharing your talent.